Awhile back I reviewed Whole Lotta Trouble by Stephanie Bond. I liked it, but it had room for improvement. I have to say, Stephanie is getting better. This review is for Party Crashers (Body Movers 0.5). If you like light murder mysteries, you'll love Party Crashers. Jolie is a character I think most of us can relate to. 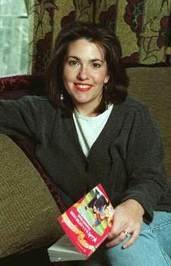 She's well developed, down to earth, and not annoying like so many humorous chick lit heroines can be. She's trying to solve the mystery of her casual boyfriend's disappearance and finds herself in a situation that is way over her head, and in the meantime she meets a hunky and wealthy hero that she's not quite sure she can trust. It's formulaic, but it's a good formula. One that will work time and again. A very enjoyable, light read. Do you like humorous, romantic mysteries? What are your favorites? 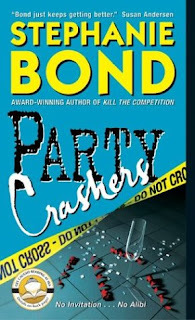 Want to read Party Crashers? You can pick it up at Amazon. Jolie Goodman never yearned for a life in Atlanta's fast lane. All she wants is a career in real estate, and she's willing to sell shoes in Neiman Marcus over the holidays to make ends meet. But recently, her boyfriend vanished -- with her car -- and her search for answers leads her to some very exclusive circles. Jolie hooks up with a pair of retail fashionistas who have made crashing society bashes an art form, and soon findsherself rubbing shoulders with the rich and famous ... and rubbing other body parts with one of Atlanta's most eligible bachelors! A COZY??? I COZY? I LOOOOOOOOOOVE cozy mysteries!!!! So added to my wishlist!